Sports brand Oakley has become the latest company to end its sponsorship of Lance Armstrong after he was stripped of his Tour de France titles. Oakley said it was "deeply saddened" but would continue to support Armstrong's Livestrong foundation. 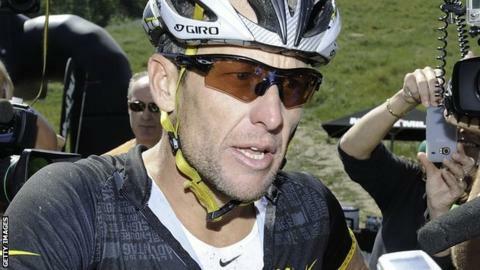 Armstrong has stopped defending himself against claims of systematic doping. The International Cycling Union (UCI) confirmed on Monday that it will strip Armstrong of his seven Tour de France titles in the wake of a damning United States Anti-Doping Agency (Usada) report alleging the 41-year-old controlled a doping culture within the US Postal/Discovery Channel team. Oakley had previously said it was awaiting the UCI's decision as part of its policy to support any of their athletes until they were proven guilty of doping "by the highest governing body of sport or court of law". "Based on UCI's decision today and the overwhelming evidence that Usada presented, Oakley has severed its longstanding relationship with Lance Armstrong, effective immediately," read a company statement. "When Lance joined our family many years ago, he was a symbol of possibility. We are deeply saddened by the outcome, but look forward with hope to athletes and teams of the future who will rekindle that inspiration." Armstrong, who recovered from testicular cancer to win the Tour de France seven successive times between 1999 and 2005, stood down as the chairman of Livestrong on Wednesday to protect the cancer charity that he founded from "any negative effects as a result of controversy surrounding my cycling career". SCA Promotions, an insurance company that paid out $7.5m in bonus to Armstrong, has demanded he return the cash in the next five days or face legal proceedings.